Enemy Mine (1985) - Sci-fi-central.com.  USA / West Germany  1985  108m   Directed by: Wolfgang Petersen.  Starring: Dennis Quaid, Louis Gossett Jr., Brion James, Richard Marcus, Carolyn McCormick, Bumper Robinson, Jim Mapp, Lance Kerwin, Scott Kraft, Lou Michaels, Andy Geer, Henry Stolow, Herb Andress.  Music by: Maurice Jarre. 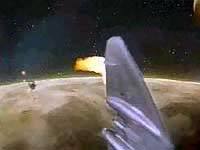 During a bloody battle, two warring ships crash on a barren planet, with only one survivor from each ship. At first, the human pilot and the lizardlike Drac continue to fight, but the planet's harsh climate and the need to survive force them to ally. Over time, they put old hostilities aside and form a friendship. When the parthenogenetic Drac becomes pregnant, the two draw closer, overcoming their external differences to appreciate each other for who--not what--they are. The film is a thinly masked treatise on race relations, handled well by its two lead actors, Dennis Quaid and Louis Gossett, Jr. This futuristic sci-fi adventure film, directed by Wolfgang Petersen, features Gossett in an intricate full-body costume for his portrayal of the alien Drac. This magnificent film has a lot to offer the viewer. From its opening to the end it keeps on a thrilling pace. You'll be glued to to the TV screen in anticipation to what happens next. It is based on the story of the same title by Barry B. Longyear. I rank this film in the same category as Robinson Crusoe On Mars (1964). 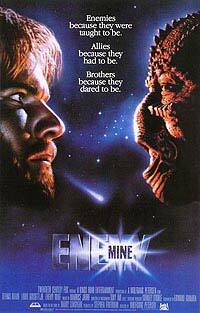 And if you think about it Enemy Mine comes close to the remake of that film. This is a film based on a theme of survival on a harsh planet with limited resources. It is also a film about friendship and understanding (or cultural exchange) between two different species. Full Plot: In the late 21st century, an interstellar war between humans (associated as the Bilateral Terran Alliance, or BTA) and Dracs (a reptilian humanoid race) is being fought. Human pilot Willis E. Davidge (Dennis Quaid) and Drac pilot Jeriba Shigan (Louis Gossett, Jr.) engage in a spacecraft battle which results in both crash-landing on Fyrine IV, a strange, dark alien world with two moons a breathable atmosphere, water, and bizarre animal life. After initial hostilities, the two eventually learn to cooperate in order to survive. They work together to build a shelter for protection against intermittent bombardment by meteorites, and to satisfy their needs for food, water, and warmth. Over a period of years, they learn to overcome their differences, become friends, and learn each other's languages and cultures. Each saves the other's life on at least one occasion. Davidge, haunted by dreams of spaceships landing on the planet, leaves in search of help. He finds signs of a human presence, but learns that the planet has been periodically visited by human miners who employ Dracs as slave labor. He returns to warn Jeriba (whom Davidge nicknames "Jerry") only to discover that Jerreba is pregnant (Dracs reproduce asexually with no control over timing of conception). The combination of a blizzard and attack by one of the planet's predators forces Davidge and Jeriba to flee their shelter. To pass the time Jeriba teaches Davidge his full ancestry, a necessity if his child is to be accepted into Drac society. Jeriba later dies during the childbirth, but not before making Davidge swear that if he ever escapes the planet to take Jeriba's child back to Dracon (the Drac Homeworld) and recite his full ancestry so he can join Drac society. Davidge raises the child Zammis (Bumper Robinson) as his own. Over the years, Davidge and Zammis form a very close bond, and although the young Drac refers to Davidge as its 'uncle', its emotional range towards Davidge is as a son would look up to a father — an emotion that Davidge shares as well. Davidge knows of the mining crews scouring the planet in search of minerals and ore deposits, and he knows that they have little regard for Drac life, so he remains on guard to keep Zammis from getting captured or killed should they run into any of the miners. 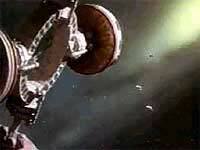 However, Zammis does not realize the danger and goes off to get a closer look at such a spacecraft. Although Davidge follows and tries to rescue him, Zammis is abducted by the humans with Davidge hurt and left for dead. A BTA patrol ship finds Davidge anonymous, unrecognizable and apparently dead, and it returns him to the space station where he was formerly based. On the station, during the funeral ceremony, Davidge awakens when one of the disposal technicians tries to steal the small book (the Talman) that Jerry had given him years before when he first wished to learn the Drac language. Davidge's former patrol crew vouch for his loyalty to the BTA, even after it is discovered that he speaks the language fluently. Sometime later, Davidge is reinstated to duty, but not as a pilot. Unable to enlist assistance to rescue Zammis from the miner villains, Davidge desperately steals a spaceship to rescue Zammis solo. He manages to find and infiltrate the miners' ship. Davidge contacts the Drac slaves in their own language which convinces them to help him overcome the brutality of the human overseers and eventually reunite with Zammis. Eventually Davidge is also assisted by a BTA crew who pursued him. They finally realize that whatever it was that he experienced while missing in action (MIA) has made him more human; he no longer hates Dracs. In the epilogue, Davidge and Zammis return to the Drac homeworld for Zammis's introduction ceremony to the Drac Holy Council so that it may be accepted into Drac society. As required and as he promised Jerry, Davidge recounts the complete Jeriba ancestry before the Holy Council in the traditional ritual, as he was taught by Jerry. A narrator explains that years later, when Zammis also has a child and brings it to the Holy Council for the same ritual, the name of "Willis Davidge" was added to the line of Jerreba. Louis Gosset Jr. is outstanding as the Drac, Jeriba Shigan. Dennis Quaid plays the fighter pilot Willis Davidge. Bumper Robinson plays the role of the offspring of Jeriba, named Zammis. 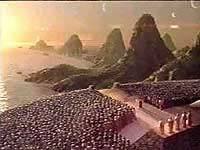 Special effects is the main plus point of the film, as it relies on them to create the harsh environment of the alien planet. Dialogue is solid and at times thought-provoking. Favorite quote by Jeriba as he is dying giving birth to Zammis: "you have divided yourselves into two sexes male and female to enjoy that brief joy of during union" (or something to that effect). Recommend you buy this film on DVD as it is a gem of a film. Review by Vivekmaru45 from the Internet Movie Database. 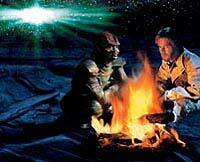 Enemy Mine Blu-ray review: war is hell.